The Crow Collection of Asian Art is a museum in Dallas, Texas dedicated to exhibiting, preserving and collecting art from China, Japan, India, Southeast Asia, and Korea spanning history. Admission to the museum is always free. The Crow Collection of Asian Art was opened as a museum by the Crow family in 1998. 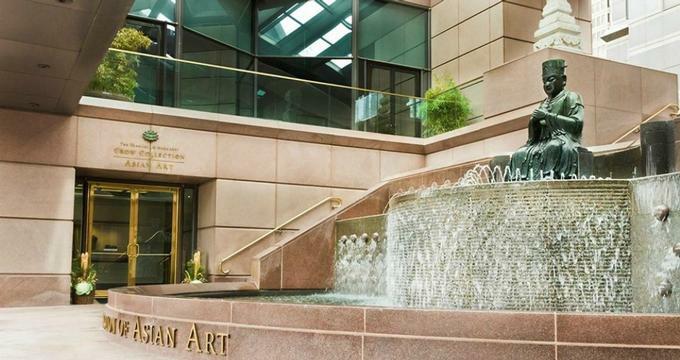 Mr. and Mrs. Trammell Crow wanted to share their love of Asian art and culture with the Dallas community and general public by displaying their collection of art that they had begun collecting in 1976 for free to the public. The Crows visited China 14 times and their purchases of Asian art were completed through private collectors, auctions, and dealers. 569 pieces of the Crow’s personal collection were selected to be included for the museum’s permanent collection with pieces from Japan, China, Korea, Indian, and southeast Asia represented. The Crow Collection of Asian Art remains one of the only art museums in the United States solely dedicated to the preservation and collection of Asian arts and now showcases works from collectors and institutes from around the world. The museum also hosts community events, cultural and educational workshops, and special events. · Shi of East & West. Qin Feng, Chinese. B. 1961. 2013. Marble and Glass. · Sweepers. Wang Shugang, Chinese, b. 1960. China, 2012. Painted Bronze. · Screen with Beauties Four Seasons. China, Qing Dynasty (1644-1911), 19th century. Jade Panels in Zitan. · Bell. Japan, Edo period (1615-1868). Bronze. · Head of Bodhisattva. Tibet, 18th century. Gesso, gilding, and pigment. · Civilization Landscape. Qin Feng, Chinese, b. 1961, 2005. Porcelain. There are many ways for the community to be involved at the Crow Collection. From workshops on various art forms such as Japanese wood blocks to special members only reception programs. Lectures- Lectures and gallery talks are hosted by curators at the museum to provide further education on exhibits and specific pieces of art work in the collection. These talks are given by curators, artists, and scholars and also address wellness and religion topics. Compassion Now- This group meets every Sunday open house style from 12-6pm. This is a time for quiet reflection with meditation mats provided. Adventure Asia- This family day is held every first Saturday and includes storytelling, art, and performances from community groups that engage children and visitors of all ages. This free program is open and suitable for all ages but is especially geared towards younger, preschool age children and parents. Kids Club- The Crow Collection and other area museum partner to create kids club, an exclusive way for children to get discounted admission into special events in Dallas that are arts and crafts based and for families to be able to stay at the host venues for free! Wellness Series- The Crow Collection wellness advisor often offers series that pertain to wellness in adults and focus on the ancient practices of Asia that are still relevant today such as self-reflection and meditation, self-care and breathing techniques. The Crow Collection is happy to host adult and school tour groups. School tours- Field Trips include in depth analysis of 2-3 works of art for groups up to 40. These tours are 1 hour long and are encouraged to be added on to self-guided tours lead by educators. There are many different themes that educators can choose from for their tours including Art making, Art & discovery, and Art& History. There are additional tours suitable for AP classes and city tours that include trips to multiple museums. Adult Tours- Adult Tour Groups are designed for groups up to 60, cover 2-4 works and are discussion based. These tours last up to 1 hour and are led by gallery professional educators. An adult wellness tour is also available that has a smaller group size and covers 2-3 works and focuses on self-reflection and contemplation. Self-guided tours can also be reserved to ensure that your group can be accommodated. The Lotus Shop is an award winning gift shop featuring a distinctive collection of gifts, housewares, home décor, and jewelry all inspired by or from Asia. The Lotus Shop has hours that are separate from the museum and often hosts its own special events such as artist pop up shop and sip and shops.